Having an organized kitchen doesn’t require one to be a clean-freak or someone with an OCD, it just has everything to do with finding things easily when you have a de-cluttered and clean place to make meals. Organizing your kitchen or your even your wardrobe has become a business of sorts for so many people out there, but why pay someone when you can do it yourself and also enjoy the process on the way. Start off with your fridge, that’s the easiest place to begin with. Get rid of all the stuff that’s past the expiry date; you’ll be shocked to know how many people consume items from their fridge that’s way past the expiry date. Now, we may deny that fact but we’re all guilty of it, there’s a reason companies give a ‘best before’ date so use it. Target sauces, jams and preserves as they’re mostly what we assume won’t get spoilt but in fact are the cause of most food poisoning and upset tummy cases. Once you’re done with throwing out stuff, invest in a couple of plastic trays which you can purchase based on your refrigerator’s measurements. Buy them keeping in mind the amount of things you will segregate, like- Sauces, Jams & Preserves, Pickles. Also, try using glass bottles to cool water. It’s healthier than plastic, get fridge friendly boxes to store food or use a good graded zip-lock pouch. Always freeze raw meat of any kind and use it once thawed, if you’re using a just a part of it, make smaller portions and store them in zip-lock pouches. The next thing you can target, is your spice & herb rack. There are a variety of sticker labels available in the market or online these days, make use of it! Some stickers are water-proof as well, get your hands on them. Once you’ve got that, label everything you have and organize them according to the amount of times you use each. Keeping the most frequently used spices on the top. Get yourself glass jars to store spices as they stay fresher for a longer period of time. It goes without saying, clear out all the expired or close to expiring products. Clear your counter and make space on your counter for essentials like tea, coffee and sugar jars. The only other things that you can possibly have on your counter is your food processor and oil canister. Get your counter to look more creative by getting a newspaper stand and filling it with recipe books. Also keep in handy a few paper clips, rubber bands, food clips, zip lock pouches and a few shopping bags. 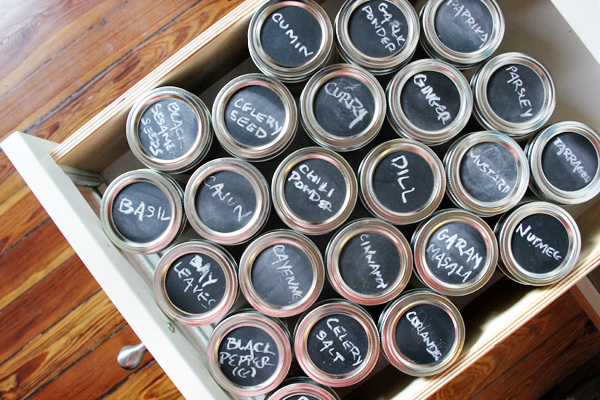 You can organize your kitchen by getting yourself colorful labels and clear storage containers. Getting a small magnetic white board to put your fridge is a great way to manage chores for kids and spouses. Add in a notepad to decide your daily menu or your grocery list. Keep your counters tidy by cleaning them regularly with soap solution and cleansing agents. Only buy products you know you will use well before 6 months of it being expired. Make your kitchen and inviting place for your family & friends to share meals.